Monson: The Jazz are down 1, two seconds left in a must-win game. Who do you want to shoot the ball? Who don’t you want to shoot it? 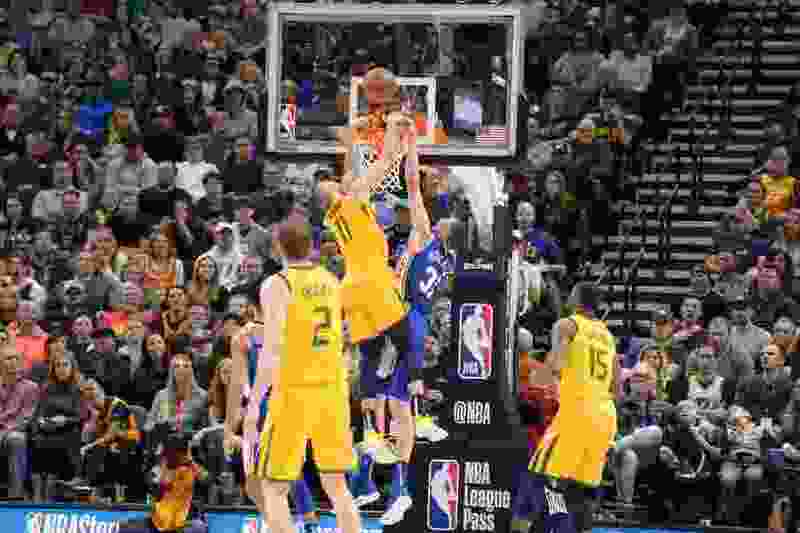 (Leah Hogsten | The Salt Lake Tribune) Philadelphia 76ers forward Mike Muscala (31) denies Utah Jazz guard Dante Exum (11). The Philadelphia 76ers defeated the Utah Jazz 114- 97 at Vivint Smart Home Arena, Thursday, December 27, 2018. This is one of those contrived beam-it-up-on-the-big-screen-in-you-brain deals, and once it’s there, ponder it a bit, and come up with your own answer. Yours might be different than somebody else’s. Here’s the picture: The clock is winding down, Jazz trail by one point with possession in an important, must-win game. The pressure is on. The building is packed. The crowd is sucking air in and blowing it out with each breath, each bounce of the ball. Every exterior thing is equal — defensive matchups, opportunity to fire off a semi-open shot from a standard spot on the floor handicapped for that particular player, which is to say: five feet for Rudy Gobert, five to 10 feet for Dante Exum, 10 to 15 feet for Derrick Favors, 15 to 20 feet for Ricky Rubio and Royce O’Neale, 20 to 23 feet for Thabo Sefolosha, Jae Crowder, Donovan Mitchell, Joe Ingles and Kyle Korver. Here’s the question: Who among those 10 players do you want to take that final shot? If we break it down by the numbers, it looks like this. Gobert leads the NBA in shooting percentage at 65.2, fueled to a large degree by his dunks. In this scenario, we are not automatically giving him the hammer. Let’s make it like this — he receives the ball five feet from the rim and must maneuver from there. Suddenly, that percentage gets a little less certain, but in recent games the uncertainty has diminished. Exum, when fully healthy, has shown the ability to creatively move toward the basket to score, flipping up floaters of all sorts, often landing awkwardly and off balance. He’s shooting 47.4 percent on 2-pointers, 43.2 overall. Favors has been working on shooting the corner 3 because the game has shifted for all power forwards, becoming a more perimeter-oriented affair. For many teams, Favors would be playing big minutes at the 5, but for the Jazz, that spot is taken. The veteran makes 58 percent of his shots, 63.7 percent on 2-pointers, 24 percent from beyond the arc, but that last number is not in play here, just the impressive middle one. O’Neale has a FG percentage of 54.2, making 50.5 percent of his 2-pointers and 39.2 of his long balls. For an un-drafted second-year player, he also seems unfazed by the moment, by the important minutes he plays. Rubio has never been known for great shooting, but he has helped the Jazz with mid-range attempts off the dribble. He shoots 43.6 percent on 2-pointers, 33.7 percent on 3s. Crowder had been buried in a significant shooting slump, until he broke out of it against the Clippers on Wednesday night, hitting eight of 15 shots, including five of 11 from 3, for 23 points. When the man heats up, he can be useful, especially in a Jazz offense in which he often ends up with an open look. Is that because of the blend of the ball or because opponents want Crowder to take the shot? It’s worth noting that he leads the league in percentage on straightaway deep shots. Overall, he makes 39.8 percent of his attempts, but his eFG percentage is 50.1. You may have a hard time imagining Sefolosha in this picture, but there’s a reason he’s in it: He’s second on the team only to Gobert in FG percentage at 61.2 percent. Granted, his shots have been limited, but Sefolosha has made 46.4 percent of his bombs, the best deep efficiency on the team. Mitchell is … Mitchell. He’s been nearly unstoppable over the Jazz’s last 10 games, hitting 46 percent of his shots, including making more than half of his 3-point attempts. Overall, he shoots 42.2 percent. This scenario is a bit unfair to Mitchell, limiting him to a deep range when he often can use his athleticism and craftiness to send up a runner or get all the way to the rim. Still, until his recent run, efficiency wasn’t his strength. Remember, this is a must-have shot. Everybody knows Ingles and Korver are 3-point specialists, although Ingles has learned to use his ability to shoot and pass to his advantage as he looks off defenders on his way to the basket for flip shots, particularly from the left side. Korver is one of the league’s all-time-best long-range shooters, currently resting fourth on the NBA’s 3-pointers-made list, but he also hits shorter shots at 48.1 percent. Ingles is shooting 43.3 percent overall, 36.5 percent from 3. Korver is making 43.5 percent, 41.7 percent from deep. Their eFGs are 53.5 and 58.3, respectively. There’s a factor here beyond the numbers — clutch shooting under pressure. That’s hard to define, harder to track, at least as it’s applied to the specific, but it’s easy to speculate about, just from experience and the way players carry themselves on the floor during tight ballgames. All of which is to say, mix in the quantifiable and the qualitative and … well, we’re just guessing here.